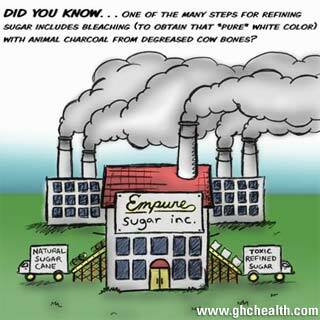 There are a few reasons why sugar has resurfaced in my consciousness as something to be very aware of. First of all, I just returned from a trip to Central America. I spent two months in Panama and Costa Rica (read about my time in Panama here). What I noticed immediately was the over-whelming presence of refined sugar, processed wheat flour (no corn!? ), refined cooking oils, and ultra-pasteurized milk in all the supermarkets — I guess this is where they originated, though. Actually, supermarkets (and the brands and products that go along with them) didn’t enter our vocabulary until about 50 years ago and they are reeking havoc on what we take to be ‘normal’ when it comes to food. I will focus on sugar in this blog as it was the most prevalent food ‘white demon’ (white sugar, chemical salt, processed flour, and pasteurized milk) than any other food product in that area (and in the US too, actually). While in Panama, I couldn’t even purchase a sweet fruit drink that didn’t have sugar added to it (or Splenda!!!). And, not just some sugar — LOTS of sugar. What I noticed — is that almost everyone was hooked on it. I also noticed that it was common to see indigenous peoples (Ngobe-Bogle and their tribal, Costa Rican neighbors the Gyuami) buying small, wrapped candies at the supermarket (with their very limited funds!). Over the years, I have noticed that when I travel to other countries, I am able to look deeper into my own habits and behaviors. It’s as if the country I am visiting is mirroring something I need to realize about myself and the culture I was raised in. Sure enough, my travels to Central America kicked up the mud in my personal pond. So, I naturally began reflecting on my own journey with sugar. When I was in elementary school, I was diagnosed with ADD (Attention Deficit Disorder). My mother luckily had a good doctor (a rare breed) and changed my diet (mostly took out dyes and preservatives, which indirectly took out sugars in my diet). My behavior, for the most part, got better; enough for me to maintain my spot in the classroom. In middle school and high school, things accelerated in their own way. In middle school, my family moved from New Orleans (beignets and snow cones!) to Mississippi (sweet tea and pecan pies!). In middle school in MS, we had a daily ‘coke break’ where we all bought a soda in a bottle and drank it — it was sometime between breakfast and lunch. No one made us buy a soda. However, we’re kids — we have no impulse control!!! And, if you didn’t buy a soda while everyone else was sipping on theirs, you’d look like a fool. Our school in Mississippi conveniently still paddled kids in those years (roughly mid 80s to mid 90s). To me, they made a little extra money on sodas, got us high on sugar, and then paddled us for ‘acting out’. At that time, our public school was roughly 50-50 black and white student ratio and what happened at school was disciplinary oppression…sometimes education. I would say, we were all mostly low to middle income families — and we were sugaring each other up, caught up in our own forms of blood-sugar imbalance and chaos. I think Jackson, MS Doctor Russell Blaylock covers issues of hypoglycemia, low-income communities and incarceration well; how they impact low-income communities and communities of color. Of course, wealthy people have similar problems — they have fancy rehab centers…low-income communities have prisons. Another bit of traveling I did recently was to New Orleans (here’s a blog from that trip). As I alluded to earlier, I lived there for about 4 years when I was younger. My father’s side of the family goes back at least 3-4 generations in that area. It’s well-known for alcohol, beignets (doughnuts with powdered sugar), well-sugared cafe au leit, and snow cones. While the ‘new me’ was walking around in New Orleans (the healthy, post-sugar me), I remembered that my father’s mother actually worked for a company that imported candy to New Orleans. She always had a bowl of candy on her desk at work and bowls of candy in her house. She was raised in Ohio, met her husband while serving in the military during WWII…had two children that grew up to be hypoglycemic. She was diabetic and had ovarian cancer. She actually died from diabetes. This is just one ancestor. Issues with sugar run deep in my family. As a child, I would do anything to get some sugar. My mother wouldn’t buy sugary products — no sugar cereal, ding-dongs, etc. So, I would raid my friend’s food cabinets and scarf down Little Debbie food snacks, Frosted Flakes, and Pop Tarts (frosted, of course). In high school, I would eat candy bars for lunch more than once a week (also because the lunch meals were so disgusting). In middle school, I would sell home-made ‘sachets’ and ‘perfume’ (basically, flower water that molded in 3-4 days) by the road and even door-to-door…so that I could buy candy bars and ice cream from the gas station down the street. I was a sugar addict. And, no one was really telling me to stop. A cautionary — “don’t eat that, it’s bad for you” — *occasionally*. However, it seemed that what I was doing was perfectly fine…I mean, every store in town sold some kind of sweets…and of course, I couldn’t get enough of it. For more information on sugar addiction and sugar being reframed as a drug, please check out this 1 hr and 30 min clip of Robert H. Lustig, MD, UCSF Professor of Pediatrics in the Division of Endocrinology discussing sugar and the fact that it is an addictive substance. And, here is a quick 8 min clip on the affects of sugar addiction by a life and wellness coach. And, for the icing on top (yes, a pun), check out Mother Jones’ Nov/Dec 2012 issue on a 40-year campaign to cover up that sugar kills. How did I kick my habit? The recovery started (unintentionally) during my time in Peace Corps in Ukraine in 1999-2000. I couldn’t even buy or find junk food or fast food in the area I served my term. I had to eat with the seasons because they only had outdoor markets and small kiosks with bare-minimum food items. There were almost no advertisements and no colorful wrappings — just food. In the Winter, you guessed it — cabbage, meat, milk and root vegetables. If you were smart and preserved food, you were lucky enough to taste Summer in the stark-coldness of Winter — in those times of eating preserved berries, for example, I truly understood how the sense could light up the mind in Kodachrome ways never imagined. These moments were not everyday occurrences — they were special, sacred moments. This was the beginning of my sugar recovery. My sugared-up, numbed-out palette was being revived by a so-called ‘poor’ country, rich in flavor and culture. The next phase of my recovery was the fact that I moved to San Francisco, CA — a haven for foodies — around 2002. When I first moved there, I took 6 months off from any alcoholic beverage and sugar — this was huge for me! And, it was incredibly difficult. During that time I ate high quality meats and whole vegetables and some whole grains. I would also eat some whole, organic dairy… After this, I learned about the Weston A. Price Foundation, took a permaculture course and started growing some of my own food, and started getting to know farms like Green Gulch Farm…meeting interesting people who learned how to change their diet, change their health for the better, and feel good. To me, all of this was revolutionary — and starkly contrasted my sugar-laden Southern up-bringing. Yoga and meditation helped me reprogram old thoughts and thought-patterns; including difficult emotions that I had become a prisoner to in the past… Herbs and plant medicine also came to my aid helped deeper hormonal/endocrine type issues… Soon enough, if I put sugar in my mouth…I would have such a bad reaction to it that I would never do it again. It wasn’t worth it. Now, I only eat raw honey, high-grade maple syrup, coconut sugar, fresh fruit, dried fruit and sometimes raspadura and sorghum. My favorites are fruit, dried fruit and honey, though. Of course — the best sweet or sugar is in whole form in the food it comes in… That food item contains all the vitamins and minerals needed for your body to process and assimilate that sugar. Outside of this whole food matrix, the sugar molecules will actually rob your body of the vitamins and minerals it needs to process the sugar; yes, therefore — sugar is a robber. Traditional Chinese Medicine (TCM) may also shed some light on this subject. The spleen is the organ related to the taste of ‘sweet’ (read an interesting article on how TCM views the organ spleen and its function here). It is ruled by the earth element and it is said that the spleen’s energy is similar to the energetics of the ‘mother’ archetype. It is the nourishing aspect of our organ system — that which knows how to give and receive, to listen and be heard…to live compassionately. TCM also recognizes that almost all foods have some level of sweet in them. The need for ultra-strong sweet, to me, reveals that there is a deficiency in the spleen’s energy. Nourishing bone broths, hearty meat and herb based soups, and well-cooked dishes with an element of ‘sweet’ are some ways to appeal to and balance the spleen’s energetics (many traditional recipes integrate sweet into their dishes as desserts really came into being during the period of European colonization). To me, this guy who speaks about UNhealthy agave syrup speaks to this as well (mineral content of food) toward the end of this clip. 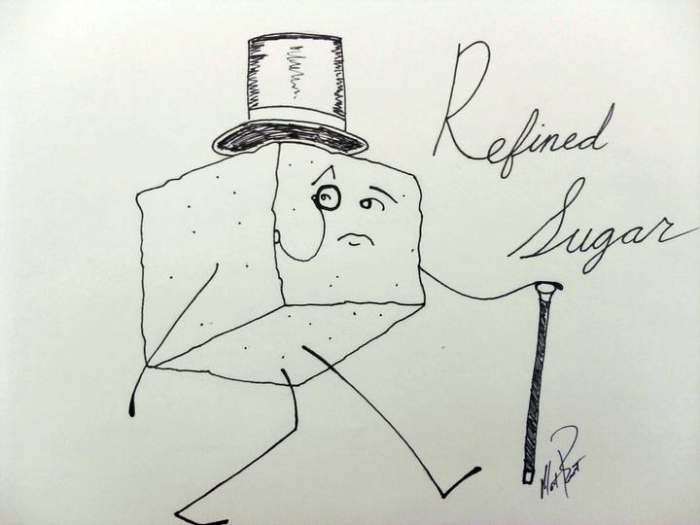 So, as you can see…sugar is not so refined. To me, more than nicotine and more than alcohol — it is the most dangerous legal drug. And, I have a good way to getting rid of all the refined sugar we have accumulated — make kombucha — it’ll turn your sugar into a sweet-sour, fizzy drink packed with beneficial bacteria and that offers support for your liver. In health and in spirit — be well. Sugar is definitely a drug! 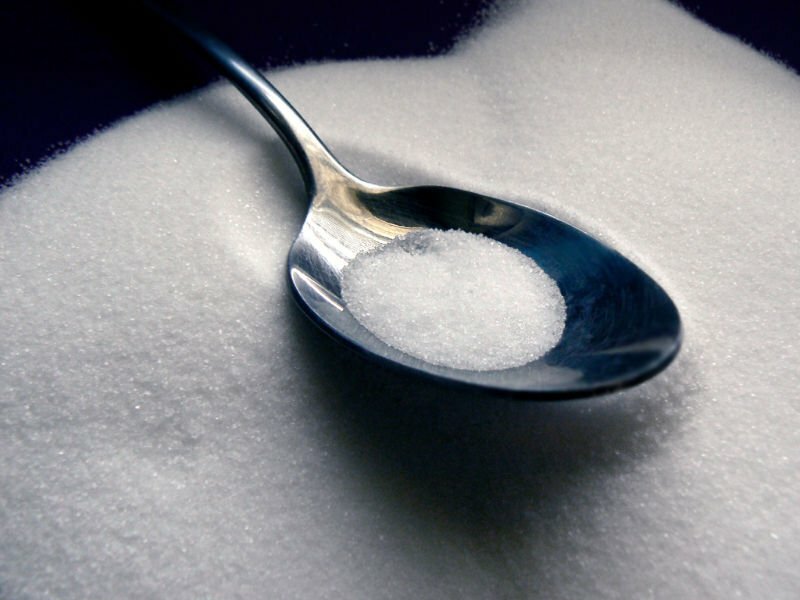 great article misses…another great book i recommend is Sugar blues….i was diagnosed with hypoglycemia at age 25…refined foods and stress brought it on …i weighed about 95lbs and could not lift my head up…from over-medication from family physician…. eventually i found a wonderful doctor from sweeden, who advised me to stop sugar and eat a high protein diet and shot me up with vitamin B… over the course of the summer my health improved tremendously.. it was then that i became interested in alternative medicine…she literally saved my life..
i have my ups and downs with Sugar cravings, especially chocolate, the really good kind….which in moderation is a good thing. I believe that so many of societies problems are attributed to sugar and the foods we eat..and sugar is definitely a drug….and THEY know it! that is why it is in everything…..
she really did, she told me she would go to court with me because the 5 hr. glucose tolerance test was so severe i was almost in shock….the bad doctor was giving me muscle relaxers for bursitis so strong a blood test was recommende every two weeks….i never had one….took this med. for months…my speech and thinking were severly effected….the good doctor was truly an angel…she looked to food and vitamins as my cure….and it worked…but through the years i was on a slippery slope of shear survival…single mom and all…working at trying to pay the rent…keep kiddies fed…then later my jenni went to warren wilson college, partied too much, but learned enough to become very interested in herbal med., studied with susan weed…and passed info. on to her mama, that be me…..the rest is history and the education continues….it is a vast and beautiful world with everything we need growing at our feet….we just need to wiggle our toes and pay attention…i love you girl and keep traveling, you are an inspiration and a friend. when i remember it is a beautiful place to be….everyone that comes into your life is a teacher….and sometimes a student….